In this 7-Day Unlock Your Mind Challenge, Follow The Step-By-Step Process To Unlock Emotions That Keep You Stuck, Underperforming, Deplete Your Energy and Happiness. > Proven roadmap for unlocking the healing potential of your mind. > A simple variety of strategies to tackle stress, deal with inner resistance, keep your mind sharp and your body energized. 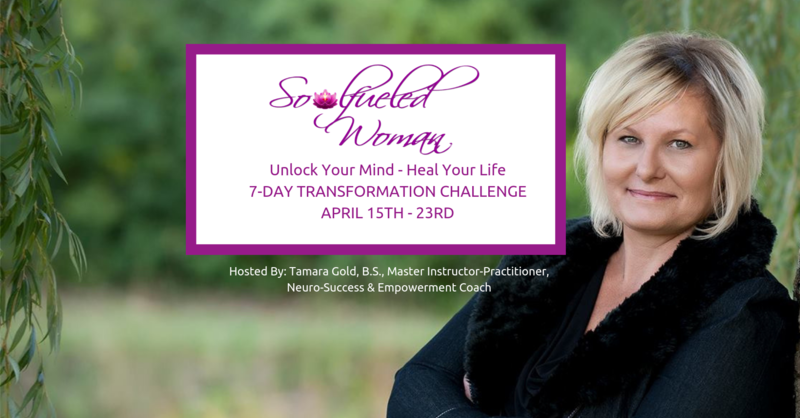 *Bonus - Participate in all 7-Days of the challenge and receive a FREE neuro-based training each month from the “SoulFueled Woman MindBody Library” filled with (over $1997 worth of) mindset, tapping, meditation and manifestation resources to create a strong foundation to help you change, heal, and thrive! "As a busy mom and business owner, I cannot believe how much I was able to shift and change in just 7-days. Tamara this challenge course is GOLD!" Theresa P.
"I've been studying personal and spiritual development practically my whole life. "There are so many hidden gems and pieces of wisdom in this training. Tamara doesn't just regurgitate methodology. unfiltered, unique and intuitive transformational wisdom." Jessie L.